A new installation has transformed the pedestrian zone on Sainte-Catherine Street in the heart of the Quartier des Spectacles in Montreal. 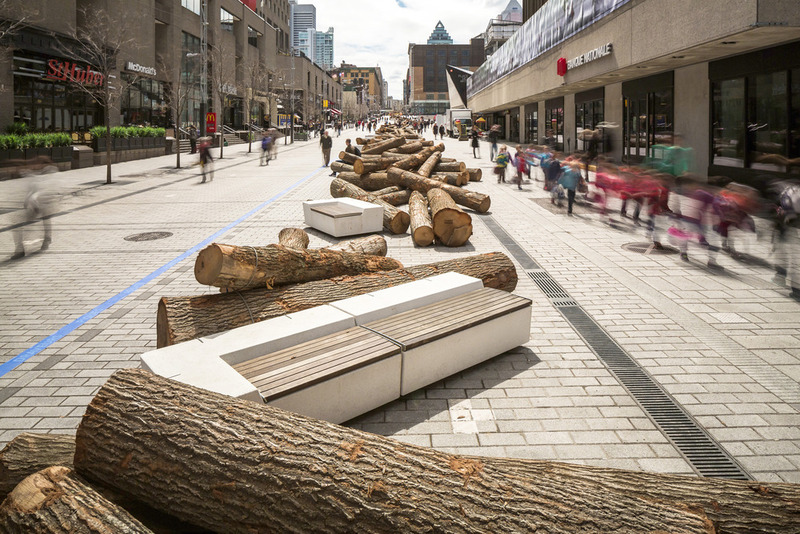 560 KM is a work consisting of one thousand logs scattered between De Bleury and Clark streets in a metaphorical representation of river driving, the 19th century method of moving timber down Quebec’s rivers. 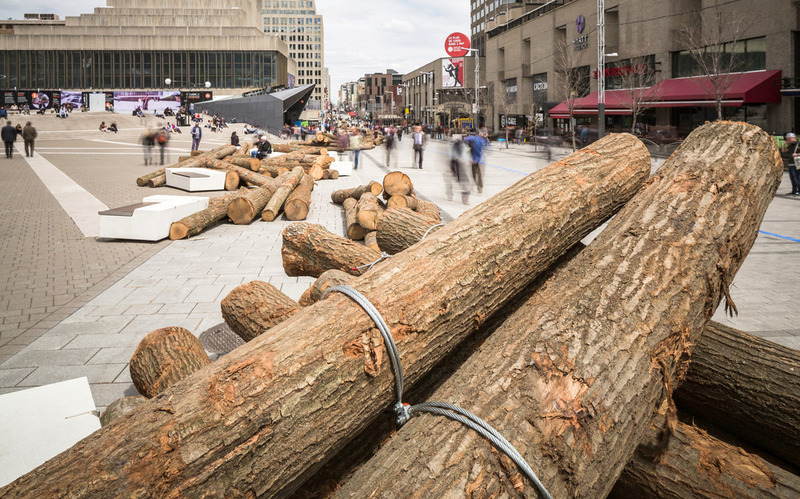 Conceived and produced by the award-winning architecture firm KANVA, and presented by the Quartier des Spectacles Partnership, the art installation is meant to enhance Sainte-Catherine St. before the festival season begins. “Our artistic intent was to reinterpret the work of the drivers who moved wood – the workers who transported the material that shaped and defined our cities, including Montreal. In a sense, logs like these are the foundation of the spaces now occupied by 560 KM,” said Rami Bebawi of KANVA. “We wanted to present a highly organic work in an urban setting, parallel to the St. Lawrence, in the hope of encouraging people to think about our connections with nature and history. At the same time, we wanted to make the space a gathering place for Montrealers and a place that sparks awareness of nature this spring,” he said. 560 KM owes its name to the length of the St. Maurice River, the last Quebec river used for floating log booms before the practice ended in 1996. All wood used for the installation (12- to 16-foot logs, each about 1 foot in diameter) comes from the West Brome sawmill. It has FSC (Forest Stewardship Council) environmental certification, indicating that the wood comes from responsibly managed forests. 560KM will be on view until May 29, 2016. 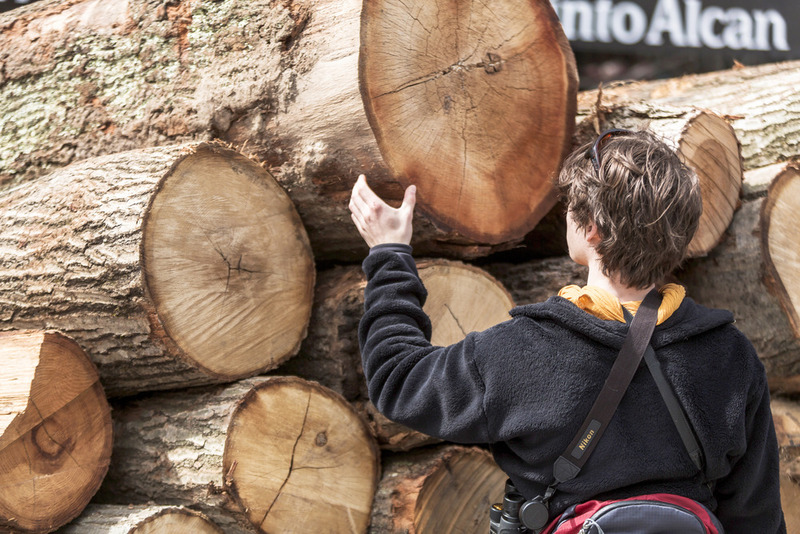 After the work is disassembled, all logs will be returned to the sawmill for processing into useful products.